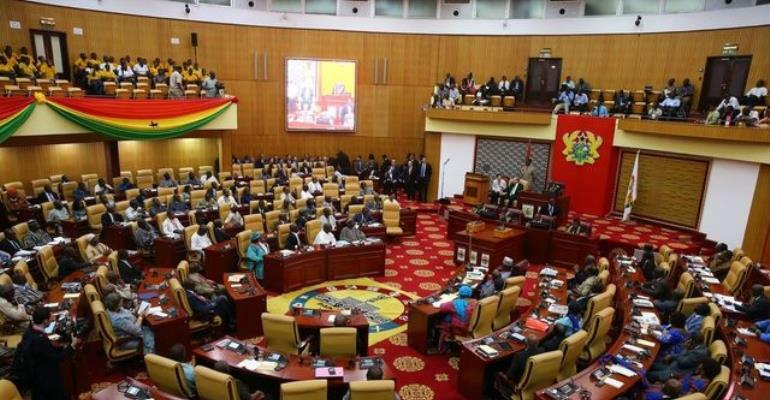 Parliament has given approval to the petroleum agreement between Ghana and Exxon Mobil for the exploration and production activities in Ghana’s deep waters. A Deputy Energy Minister, Dr Mohammed Amin Adams who moved a motion on behalf of the sector Minister for the approval hailed the terms contained in the deal describing it as the best so far in the history of the country but the minority members disagree and described the deal “as a financial loss” to the state. Ghana is expected to derive approximately 65% -84% of the local net oil depending on the profitability of the project following the ratification of the ExxonMobil petroleum agreement by parliament. This was contained in a report of the select committee on Mines and Energy on the Petroleum agreement by and among government of Ghana, the Ghana National Petroleum Corporation(GNPC),ExxonMobil Exploration and Production Ghana(Deepwater) Limited and Goil Offshore Ghana Limited in respect of Deepwater Cape Three Points Block(DWCTP) Offshore the Republic of Ghana. The reported was presented by Vice Chairman of the Committee, George Mireku Duker on behalf of the committee. According to the Deputy Minister, Ghana stands to benefit of up to 84% of the total net oil that will be derived from the deal. “With this current ExxonMobil, in spite of the waivers or exemptions that we are granting to them, the total net oil that Ghana will get is up to 84percent and this is the highest so far in the history of our country. "The last we had was 74percent under the NDC and with this we are going to achieve 84percent. If you look at the contract they have signed in the past and they say they have better terms, between 2013 and 2016, they signed 13 contracts with so called better fiscal terms. "Today these companies are not performing, they have spent US$890m to drill 14 exploration wells, today not a single well has been drilled and they spent only US$95m out of the US$890m they are supposed to have spent. We are looking for companies that have competence and ExxonMobil is a company that can make a discovery” he said in an interview with Journalists after the ratification of the agreement. Among the high points contained in the terms that generated mixed reaction during the debate was the loss carry-forward/capital allowances. The Committee noted that the Income Tax Act,2015 (Act 896), provides for only five-year loss carry-forward for all Upstream Petroleum operations. However, considering the significant initial capital outlay and the risk associated with exploration activities in the contract area, it is conceivable that some costs may remain un-recovered beyond the fifth year. The Contractor is therefore seeking for an extension of the loss carry-forward beyond the fifth-year up to at least the tenth year. The ranking member of Finance Committee, Casiel Ato Forson indicated that the government has failed as far as the whole negotiations were concerned. “We have seen that we have failed as far as the negotiations are concerned. I am particularly worried about our negotiations relating to additional oil entitlements (economic rent tax), unfortunately this government has negotiated it in such a way that it is lower than all the agreements we have signed so far, that is not acceptable. We have also asked that withholding taxes on dividends be reduced to zero per cent instead of the normal eight per cent according to our laws(Income Tax Act, Act 896) he said”. He also maintained that the financial costs that should be carried forward for five years, which has now been moved to ten years has huge revenue implications and those that carried out the agreement has “caused financial loss” to the nation. Net oil in this context is defined as total oil produced less exploration, development and production costs. A commercial discovery will also stimulate more exploration and production activities in the other sedimentary basins offshore Ghana thereby increasing the fortunes of Ghana in search of more oil and gas deposits. The Committee observed that adequate provision has been made in the agreement for local content participation in the petroleum operations. For instance, GOIL Offshore Ghana Limited, an indigenous Ghanaian company, owns five percent equity participating interest in all the petroleum operations and rights under the agreement. Furthermore, the report also reveals that provisions have been made in the agreement to ensure transfer of knowledge and employment opportunity for Ghanaians. For instance, the contractor is required to make deliberate effort to support personnel of GNPC to acquire knowledge and skills in petroleum science, technology and engineering in addition to agreeing to accept people for on-the-job trainings. Others contained in the report include a tax exemption, which the agreement immunes the contractor from such possible restrictions. The contractor is entitled to receive, remit, keep and utilize freely abroad all the foreign currency intended for its operations without any restrictions. According to the report, Minister of Finance, Ken Ofori-Atta explained that the Bank of Ghana has agreed to waive the restrictions considering the impact of the restrictions on the operations of the Contractor and the potential benefits that may by accrued to Ghana. An amount of US$2million per contract year and one-time payment of US$7million have been provided as training allowance and technology support respectively, all geared towards equipping Ghanaians with the requisite skills and expertise to actively participate in all aspect of the petroleum operations. The agreement is effective for a total of 25years if a commercial discovery is made. Pursuant to section 14 of Act 919, the Minister may approve an extension for an additional five years, subject to ratification by parliament. The agreement however expires after a 7year exploration period of no commercial discoveries made within that period. Additionally, the Income Tax Act,2015(Act 896) provides for a dividend withholding tax of eight percent for the petroleum sector. By the necessary implication, contractor’s effective tax is increased from 35percent to 43percent. The Contract Area is located in the Tano-Cape Three Points basin where exploration activities have been consistent in the last ten years with significant inputs by GNPC, Vanco and Lukoil. The Tano basin has a prolific deep-water geological structure that plays host to numerous oil, gas and condensate discoveries. The Jubilee Oil Field is located to the north of the block, while the Paradise, Pecan and Almond oil/condensate discoveries are located to the west and the Dzata oil/condensate are located to the east of the contract area.